If there was any question about whether or not Shelley Olds is feeling the lingering effects of a broken rib suffered at Ronde van Drenthe in March, it’s been answered with her outstanding performance at BC Superweek. 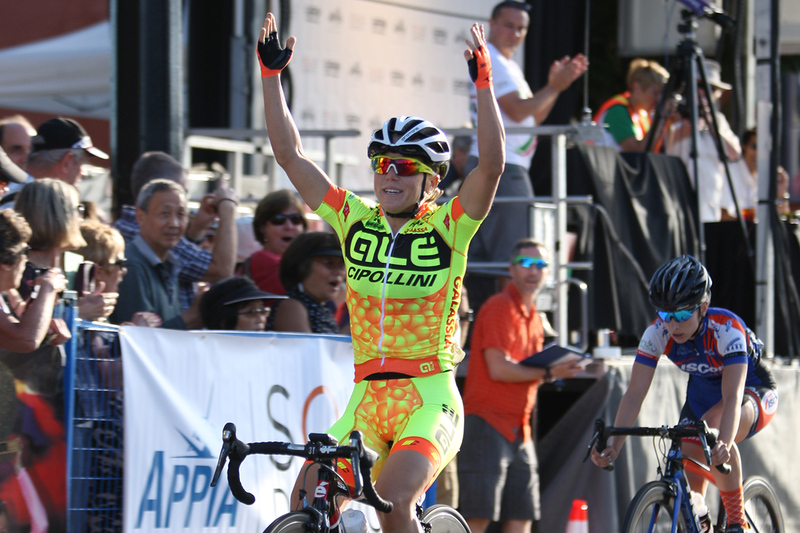 Through six events at BC Superweek, the 34-year-old from Gilroy, California riding for Ale-Cipollini out of Italy has been on the podium in every single one of them, including a win in Thursday’s Giro di Burnaby p/b Appia Development. Not only has Olds been among the top three finishers in each BC Superweek event thus far, but she’s also been a “prime machine”, picking up hundreds of dollars in cash and prizes at each race. A winner at the Giro di Burnaby in 2007, Olds used her experience on the course which runs the span of Hastings Street between Madison Avenue and MacDonald Avenue in the historic Heights neighbourhood in Burnaby to propel her to the repeat victory. “The roads are too big (for a real breakaway), there’s a headwind at the longest section, so it is really hard to go on the break,” she said. Coming off a dominant performance at Wednesday’s Global Relay Gastown Grand Prix in which she nearly lapped the field, Vancouver’s Denise Ramsden (Trek Red Truck Racing p/b Mosaic Homes) had a target on her back as the riders were well aware of the damage she could do. In fact, Olds was marking Ramsden’s wheel for a lot of the race. Making her second podium appearance at BC Superweek was 24-year-old Samantha Schneider (ISCorp p/b Smart Choice MRI) in second place, as she just wasn’t able to catch Olds in the sprint to the finish line. The West Allis, Wisconsin product, who is an 11-time US National Champion, won the UBC Grand Prix p/b Mahony & Sons on Tuesday. New Zealand native and veteran rider Joanne Kiesanowski (Team TIBCO-SVB) came third for the second time at this year’s BC Superweek series. The 36-year-old, who is a three-time Olympian and eight time National Champion in her home country, was also third in Sunday’s White Spot | Delta Road Race. As someone who rides for an Italy-based team, Olds sensed a familiarity in the Heights Neighbourhood – one that is noted for its large Italian community.